Today I have, not 1, but 2 inspirations for you, thanks to French Knot Studios and Izzy Hudgins Photography! These inspirations include 2 great Fall DIY Flower Packs from FiftyFlowers.com and they could easily inspire a Fall Wedding, a Thanksgiving Tablescape or a Thanksgiving Wedding (cause when you think about it, a wedding on Thanksgiving weekend is genius…you have a long, hopefully work free, weekend, friends and family are already gathering, and everyone is in the mood to celebrate!). The DIY Flower Combos used in these inspiration are the oh so popular for Fall, Pumpkin Fall Flower Pack, which includes 4 bunches of red tinted Sunflowers, 4 bunches of Safari Sunset, 4 bunches of assorted Millet, 4 bunches of Pumpkin Trees and 4 bunches of Seeded Eucalyptus, and the Fall Bulk Flower Pack, which includes 2 bunches of Chili Peppers, 2 bunches of Seeded Eucalyptus, 2 bunches of Broomcorn, 2 bunches of Sunbrite Sunflowers and 2 bunches of Safari Sunset. Love the look but want to glam it up a bit? 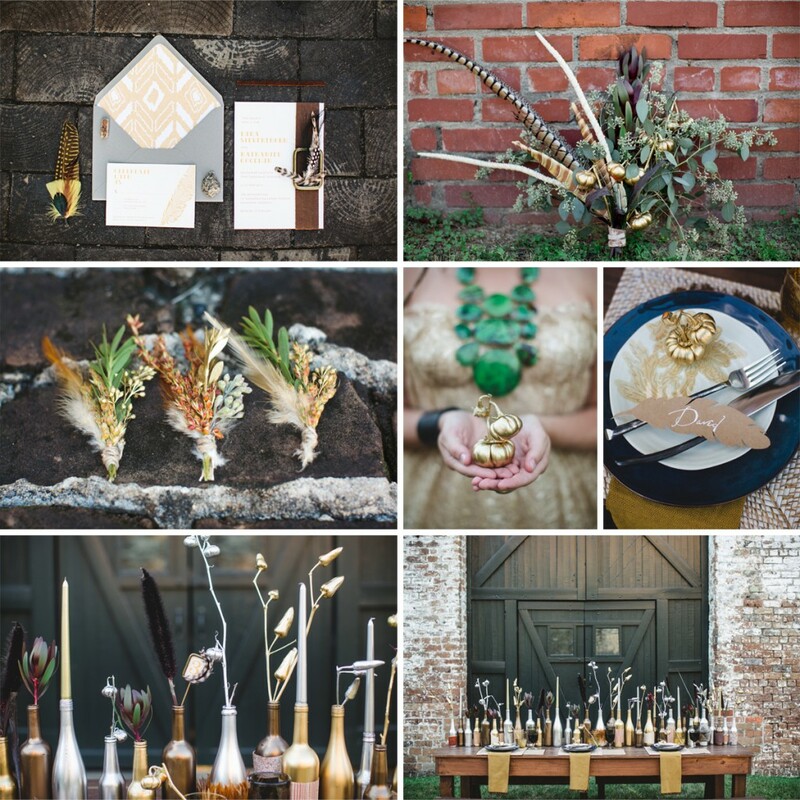 Just use that gold and silver spray paint on select blooms and sprigs of greenery! 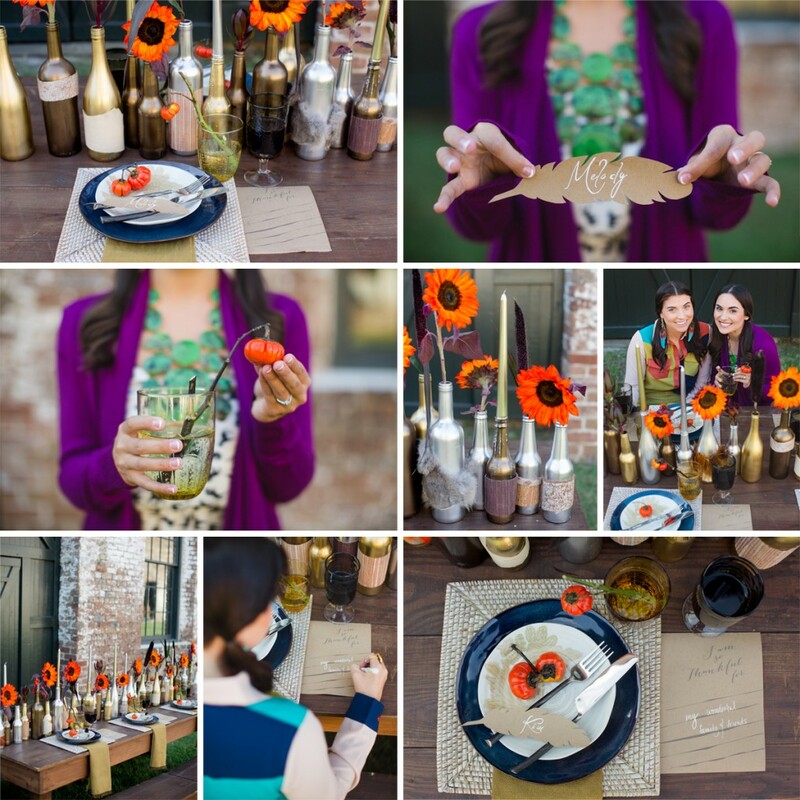 Take a look at how the mini pumpkins and the chili peppers transform from cute and festive to glitzy and glamorous! And check out that bouquet…perfect for a Fall Boho Bride! Seeded Eucalyptus makes up the bulk of the bouquet with a few stems of Safari Sunset, Gold Pumpkins and Feathers, cause you can’t do a Thanksgiving Wedding Inspiration without some feathers! Want More? This look was featured on 100 Layer Cake! So, which one do you like best? Festive Fall Color or Glitz and Glam? Tell us in the comments below!